Pretty much everywhere, it’s gonna be hot. For now, at least. 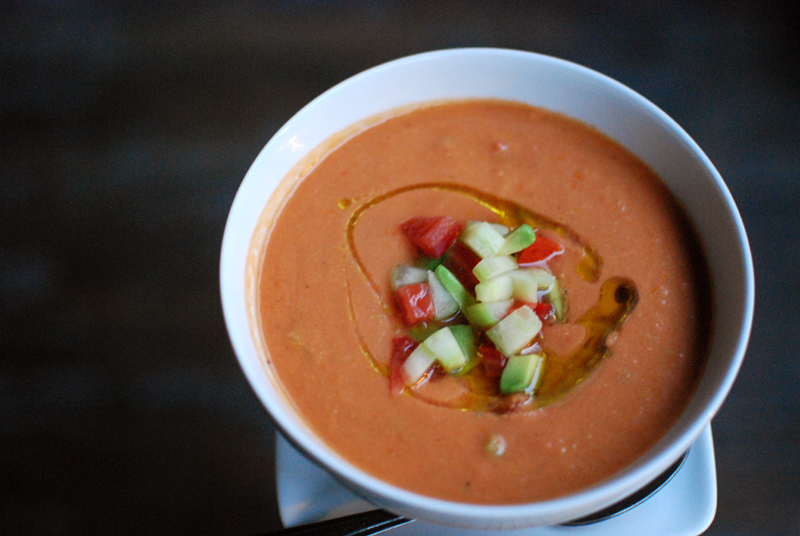 How about some gazpacho while the heat lasts? But let’s do it properly. Please, please, please, do not just cram some tomatoes, red onion, and bell pepper in a blender and hit “go”. You might as well blend up a jar of salsa. One issue with cold food is that cold mutes flavors. Something that tastes subtle and sophisticated when warm will often taste flat and muted served cold. To boot, raw tomatoes lose a crucial flavor compound when chilled. You see why a chilled purée of raw tomato will basically taste like the most boring salsa of all time. 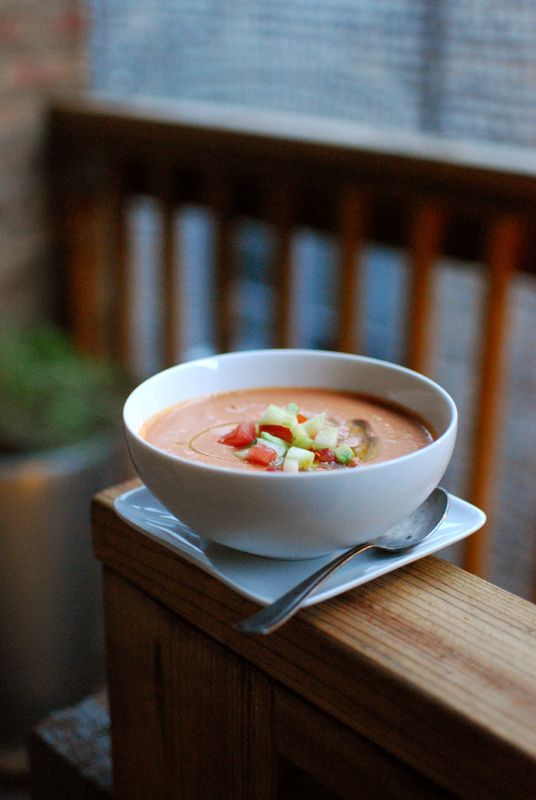 Yet most gazpacho recipes — from reputable sources! — direct you to produce just that. This is unacceptable. A recent issue of Cook’s Illustrated featured an interesting method for maximizing the tomato flavor in a chilled tomato soup: roasting half the tomatoes to deepen the flavor, and using a wodge of tomato paste in the mix. Using concentrated flavors like that, along with the brightness of raw flavors, is brilliant. Requiring gazpacho, I added cucumber, bell pepper, red onion, breadcrumbs, and certain spices. You could add some parsley, cilantro, or basil, but for once I didn’t find it necessary. Personally, I like soups with bits of things in them. So this recipe calls for some of the ingredients to be reserved, diced small, and stirred in after blending. If you don’t care about that, feel free to blend everything up together. It’s also faster that way, if you’re into that sort of thing. Avocado made a fantastic, if non-traditional, garnish. If you want some protein, a chopped hard-boiled egg works well; and please don’t tell anyone in Spain but I liked it with diced firm tofu too. This surprisingly filling soup begs for a piece of quality crusty bread for dunking, and a simply-dressed arugula salad on the side is a no-brainer. For wine, nearly anything with higher acidity will work well, but a crisp white seems most appropriate. Spanish wines are a good choice (um, obviously). And please, save the salsa for the tortilla chips. I don't specify a particular type of bell pepper; I have used green and red in this, and both were lovely. I default to green, but that's just a personal preference. As for the chile pepper, if you like it spicy, use a Serrano. If you are a wuss, use a jalapeño. No, you don't have to line your baking sheet with aluminum foil to roast the tomatoes, but the acid in the tomatoes will permanently discolor (etch? mar? stain?) your pan if you don't. Fair warning. 1. Preheat oven to 375º F. Position a rack in the center of the oven. Line a rimmed baking sheet with aluminum foil, and coat lightly with olive oil. 2. Cut 1 pound (about 3) of the tomatoes in half horizontally, and remove the core. Place cut-side up on the prepared baking sheet, drizzle lightly with olive oil, and sprinkle with salt and black pepper. Place unpeeled garlic cloves on one corner of the baking sheet. 3. Roast tomatoes and garlic for 25 to 30 minutes, or until tomatoes are softened but not browned. Remove from the oven and let cool for 30 minutes, to approximately room temperature. 4. Meanwhile, prepare the remaining ingredients. Core the remaining tomatoes. Cut 1 pound of them (about 3) into eighths, and place in a blender. Chop the other 1/2 pound (about 2) into very small dice, and set aside in a medium bowl. 5. Prepare the cucumber, bell pepper, and red onion as directed. Chop half of each into 1-inch chunks and add to blender. Cut the other halves into very small dice, and add to the reserved diced tomato. 6. Chop the jalapeño or Serrano roughly, and add to the blender, along with the panko, tomato paste, cumin, paprika, cayenne, 1/2 teaspoon salt, 1/4 teaspoon black pepper, sherry vinegar, and Worcestershire sauce. 7. When roasted tomatoes have cooled, add to the blender, along with the roasted garlic (squeezed from the papery peel). Blend until smooth, stopping and scraping the sides down if necessary. With the blender running, drizzle in the olive oil. Stop the blender (I really hope I don't have to tell you that, but hey hey). Taste, and correct seasoning if needed with salt, pepper, olive oil, and/or sherry vinegar. 8. 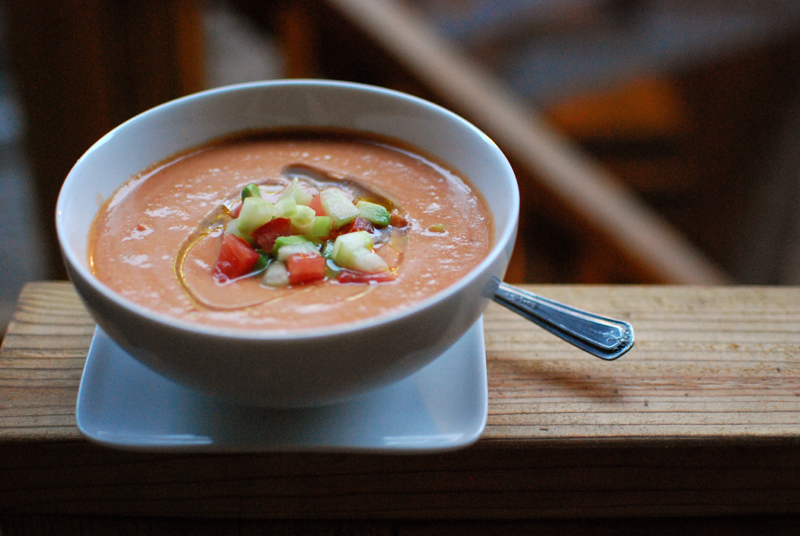 Pour gazpacho into a suitable storage container (a gallon zip-top bag works well in a pinch). Stir in reserved diced tomato, cucumber, bell pepper, and red onion (reserve some for a garnish, if desired). Chill for at least 2 hours and up to 2 days. Serve cold, with a drizzle of olive oil on top, any garnishes, and a generous piece of crusty bread. Best eaten outside on a sultry day, around sunset, with good company.